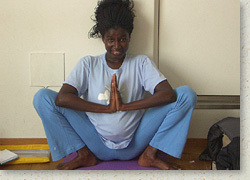 Prenatal yoga is an excellent way to prepare for the birth of your baby. Many expectant mothers discover the inner joy and balance that is benefited from the practice and certainly continue after giving birth. Discover the potential to influence your body and mind in a positive way. Experience and practice the emphasis on self-awareness, relaxation and equanimity which is the perfect preparation for your childbirth. Adjust to your inner and outer changes with extraordinary flexibility and release physical tension in your muscles and joints. Increase your energy and vitality and learn how to relax deeply and quieten your mind. 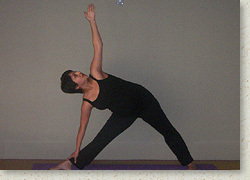 Postnatal yoga is a gentle way of helping your body recover after the birth of your baby. Through a series of exercises specifically aimed at developing strength and stamina in your body, you will gradually obtain your optimum fitness levels. Generally speaking it is safe to start postnatal Yoga from 6/8 weeks after a natural birth, usually after your first check-up. If you had any complications or a c- section it is advisable to wait a little while longer, please refer to your doctor first before embarking on your Yoga course. When to start attending a yoga class after birth will depend entirely on your fitness level and ability for your body to recover quickly after birth. Even women who have practiced Yoga for years prior to giving birth, find they are more comfortable in a postnatal class or a beginners level Yoga class for up to a year afterwards. or - just listen to your body. It does not matter if you have not done yoga before. Postnatal Yoga is a gentle beginners style Yoga class and previous experience whilst helpful is not necessary. Develop flexibility, strength and stamina in your body. Regain good posture and correct alignment of your spine, in order to avoid any lasting back problems. Gently regain strength in your abdomen and work on balancing and concentration. Gain an overall sense of well-being. Regain your levels of energy and help to develop optimum health. Enjoy some exercise and have some time for yourself! meditation and exploring various healing modalities for over twenty-five years. 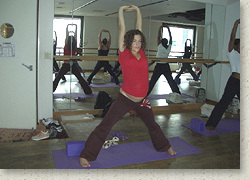 She is the original Pre/Post Natal yoga teacher since the founding of Tokyo Pregnancy Group by Elena de Carplus and has been teaching Pre/Post Natal Yoga for over fifteen years. She is a certified senior level certified BKS Iyengar Yoga method instructor. (Permission for the specific instruction of therapeutic, restorative and prenatal yoga). She spends four weeks a year for her personal retreat, detoxification and self-development. Rajay has an intrinsic interest and continuing commitment to exploring the subjects of hatha, therapeutic and restorative yoga. She also has a keen continuing interest in various meditation techniques, sound therapy, holistic health, ayurveda, detoxification, aromatherapy, herbology, nutrition, self healing, health and rejuvenation.